Tera lies 85 km west of the town of Bhuj. 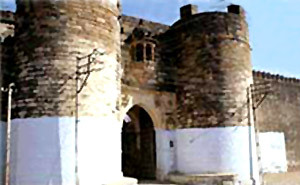 Tera castle on the western edge of the state of Gujrat dominates the plains of Kutch from its position on the banks of Tretara (Three lakes) namely Chattasar, Sumerasar and Chatasar. Tera Jagir consisted of 41 villages and was one of the largest Jagirs of Kutch state. There are Ramayan wall paintings in the Tera castle. There are elaborate carved and beautiful paintings on glass in the Jain temple. Bandhani (tie & dye), Block printing, mirror work, Jats embroidery are the main crafts of this town. There are many of wild life animals chinkara, Blue Bull, Wild Boar, Hyena, The Great Indian Bustard, Peacock, Black partridge, etc. A very famous Mahadev temple Pinglaswar is 35 km far from Tera.